Can't sew? No time for crafting? 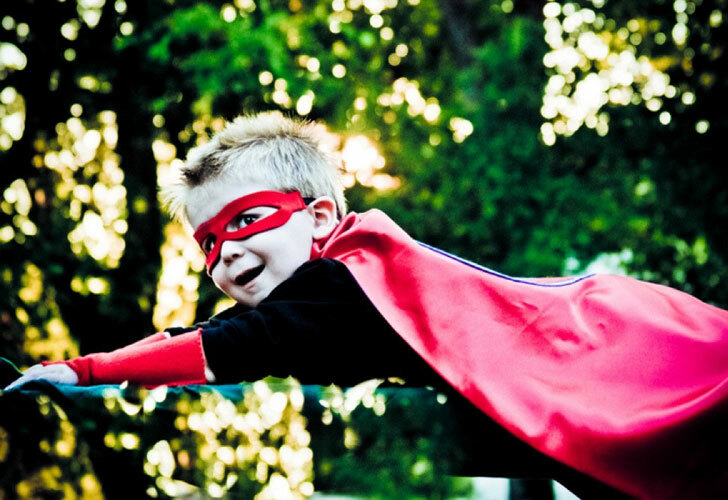 That doesn't mean your kid has to go trick-or-treating in a plastic, store-bought costume. We scoured Etsy to bring you our favorite handmade Halloween costumes that are greener and more unique than your other buy-it options, and we bet your kids will like these better, too. Read on for six awesome ideas from the Loch Ness Monster to the cutest shark attack ever. 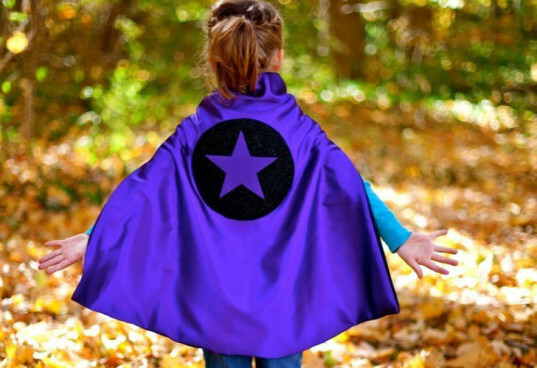 Super girl, super rockstar, super cowboy — with Pip and Bean’s selection of clever capes and the option to dream up a custom cape of your own, the possibilities for super powers are endless. We recommend keeping the rest of the costume simple. Dress up your child all in one color, or in a t-shirt that coordinates with the cape’s theme and she’ll be Halloween-ready in no time. Scare your friends this Halloween with a shark attack costume for your baby. This handmade sleeping bag costume is made for newborns to 12 months. It’s the perfect costume for little infants who aren’t moving around too much yet, and it’ll keep them nice and warm, even in chilly weather. The shark costume is hand knit from super-soft 100% lambswool. OK, so this costume is a bit of a splurge, but it’s also totally amazing. The Dinosaur Suit costume is a full body suit has mitten-style claws, a hood with fangs and a tail. The whole costume is made of durable eco-friendly felt made from plastic bottles and can be customized to whatever color you and your child would like. 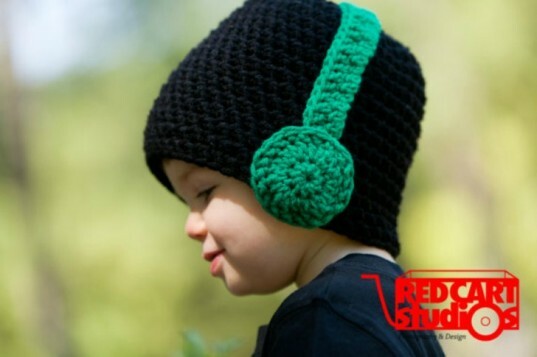 Totally adorable and totally practical, this headphone beanie will keep your little one’s ears warm on Halloween and make her look like a superstar DJ all at the same time. You can also choose the color for the headphones. This beanie is hand knit and available in six sizes for newborns up to 4T. 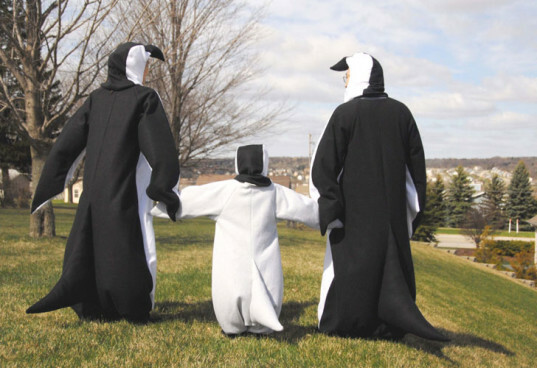 Make Halloween a true family affair with a set of matching handmade penguin costumes. Available for adults and children, you can order the right amount and sizes to turn your whole brood black and white for fright night. 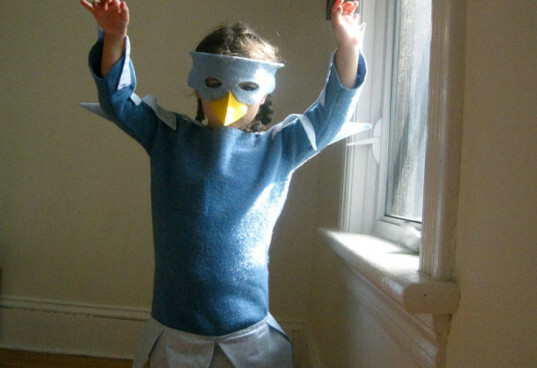 Inspire your tot to take flight this Halloween in SewnNatural’s upcycled bird costume. The bird dress is made from an old soft blue sweater with a cotton skirt sewn below the drop waste. Arms are adorned with feathers and a beak accents the mask, which is constructed with extra-large eye holes for safety. This one of a kind costume will fit a child 3T-5T. If you have an Angry Birds fan to dress this Halloween, you just might appease her with this cute getup. Super girl, super rockstar, super cowboy -- with Pip and Bean's selection of clever capes and the option to dream up a custom cape of your own, the possibilities for super powers are endless. We recommend keeping the rest of the costume simple. Dress her all in one color, or in a t-shirt that coordinates with the cape's them and she'll be Halloween ready in no time. Scare your friends this Halloween with a shark attack costume for your baby. This handmade sleeping bag costume is made for tot's newborn to 12 months. It's the perfect costume for little infants who aren't moving around too much yet, and it'll keep him nice and warm even in chilly weather. 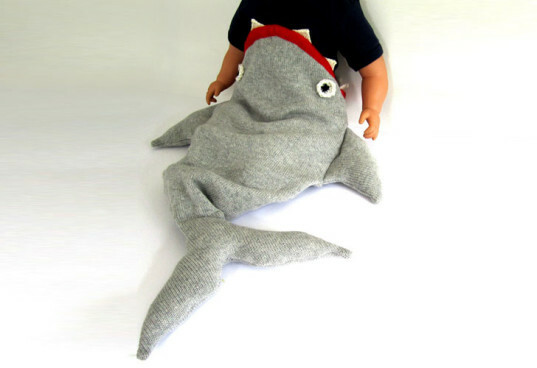 The shark costume is handknit from super-soft 100% lambswool. OK, so this costume is a bit of a splurge, but it's also totally amazing. 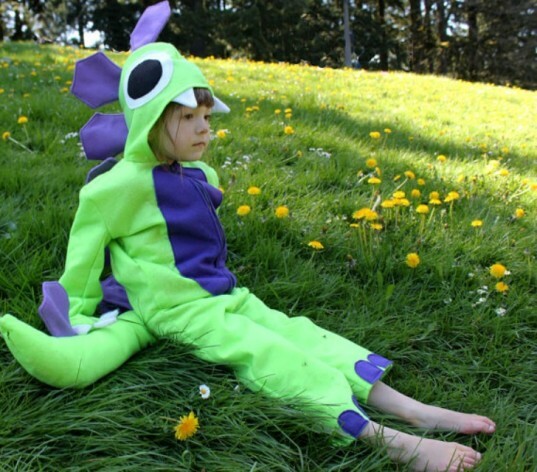 The Dinosaur Suit costume is a full body suit has mitten-style claws, a hood with fangs and a tail. The whole costume is made of durable eco-friendly felt made from plastic bottles and can be customized to whatever color you and your child would like. Totally adorable and totally practical, this headphone beanie will keep your little one's ears warm on Halloween and make her look like a superstar DJ all at the same time. You can also choose the color for the headphones. This beanie is hand knit and available in six sizes for newborns up to 4T. Inspire your tot to take flight this Halloween in SewnNatural's upcycled bird costume. The bird dress is made from an old soft blue sweater with a cotton skirt sewn below the drop waste. Arms are adorned with feathers and a beak accents the mask, which is constructed with extra-large eye holes for safety. This one of a kind costume will fit a child 3T-5T. If you have an Angry Birds fan to dress this Halloween, you just might appease her with this cute getup.